Opera or oratorio? In the combined forces of John Adams and Peter Sellars, the line of distinction becomes even more blurred, if not eradicated. The success of their opera-oratorio El Niño surely provided a template for this retelling of the Passion story of Christ. Using the technique of juxtaposing texts from other languages and time periods with biblical ones, Sellars weaves a narrative that is familiar yet untrodden. Less than one year after the world premiere of The Gospel According to the Other Mary, the LA Phil presented a more svelte staged version in anticipation of their European tour. For more information on the world premiere last May, you may want to refer to my review here. As someone who was enthusiastic at the first performances last year, I found myself lamenting throughout Sunday’s performance that the piece was ever presented unstaged at all. The piece now flowed with a more effortless narrative and seemed to fly by at parts that previously seemed cumbersome (doubtlessly thanks to some smart revisions on Adams’ part). Sellars’ staging was an assault on the senses with physical involvement by the singers to an extent I have never seen before. All singers and chorus were off-book and thrown into the drama in the most corporeal way imaginable. The three dancers were more dramatic mimes than dancers, with one often partnering with a singer to enact the text being sung, a manifestation of “the other.” Whether it was the motion of slashing Mary’s wrists while she was singing of suicide, or enacting a strip search during the beginning prison scene, the singers and dancers were put through the ringer and responded with visceral efforts. Furthermore, Sellars often prescribed hand gestures to correspond to keywords in the text that singers would execute while singing. Given that the amount of music was (conservatively) around two hours, the demands on the singers were virtually unprecedented. The chorus was not excluded from such direction as well, acting out the gestures, including mimed police brutality synchronized with orchestral sforzandos. Remarkably, the singing was all-around outstanding and rarely hindered by the action onstage. Led by the tireless Kelley O’Connor, the entire cast (and it truly was an ensemble effort) sang with impeccable musicality, vocal endurance, and searing pathos. O'Connor's youthful but worldly mezzo was pushed to the limits of its range and she responded with effortless sound. Her commitment to the text made it crystal clear and resulted in a completely absorbing character. Tamara Mumford's mature contralto voice paired wonderfully with O'Connor's and the former had some of the most touching singing of the performance; she was highly sympathetic. Russell Thomas blew his two formidable tenor arias out of the water. The first, the challenging "For the grave cannot praise thee," was accompanied by an athletic, rhythmically exhausting dance by Anani Sanouvi, and sung with unbelievable, raw power. The second, "Tell me," was imparted with soaring lyricism. The three countertenors sang with keen musicality and attention to detail. All three had distinctive voices that blended together to create a fittingly ethereal sonority. All singers wore body microphones, but any amplification was very subtle if not non-existent from my position in the hall. All three of the dancers performed with determined dramatic conviction and inspiring stamina. As unique and powerful as this music is on its own, it really came alive through Sellars’ staging. It helped give narrative to the musical interludes and establish a more relatable story. While severely limited by the dimensions of the Disney Hall stage (most action was on two platforms on either side of the stage, with the chorus behind the orchestra on one level), Sellars made the most of the available space, and the performers navigated it impressively. Lighting was utilized often with sudden shifts to alarming reds highlighting the textual changes. Costumes were all earth toned, yoga-type,patterned outfits, with many of the characters, including Mary, in a politically-charged hoodie. The most well-rounded scene of the entire piece is still the third scene in the first act which tells the story of Lazarus. The actual resurrection of Lazarus’ motionless body, being raised from under a large blanket by one of the dancers, was spellbinding when combined with Adams weird, exotic music. The hug between the two sisters and their now-alive brother at the conclusion of that scene was one of the most emotionally arresting moments in the entire piece. There were some moments in the second act, particularly in “Golgotha” and “Night,” that seemed to drag slightly, but the music is still filled with questioning and uncertain anticipation that seems fitting. 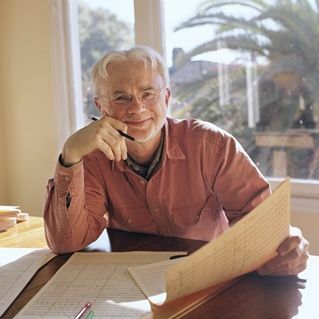 At the conclusion, like other moments throughout the piece, Adams and Sellars use the verbatim biblical text to bring the listener closest to the metaphysical core of the piece’s motive. In creating a complete theatrical piece to tell this story, Adams and Sellars continue to defy genre and their art’s preconceived limitations to create a deeply moving masterpiece.